SHOALHAVEN motor racing outfit MRTeam have proven they are serious about their future in the sport with an impressive debut appearance at the world famous Mount Panorama motor racing circuit in Bathurst. Milton racing brothers, Reece and Ryan Marchello, stunned their more experienced competitors by racing their black V8 Commodores at the front of an improved production car field made up of competitors from around the country. Racing as a support category for the recent Bathurst 12-hour endurance race, the boys had a twenty minute practice session followed by qualifying to learn the demanding and dangerous 6.2km circuit and the pair were tested by the tough conditions. “The temperature for qualifying was the hottest session all weekend, and it was demanding on drivers both physically and mentally,” MRTeam manager Terry Marchello said. qualifying sessions Reece lined up 12th and Ryan 15th on the grid for their first race. When the lights turned green both boys realised why the circuit has such a big reputation. “To describe the first lap of race one as insane would be an understatement,” Ryan laughed. With their car set up suited to the twists and turns across the top of the mountain and the power from their V8 motors hurtling them down the long straights, the two boys started posting lap times four seconds per lap faster than their qualifying pace. Reece passed bunches of cars throughout the first few laps and moved up to fourth place and started to pull a gap on the chasing field that included brother Ryan in eighth position. Unfortunately Ryan suffered brake fade at the end of Conrod straight and speared down the escape road dropping him to 15th position. Back up front Reece was punching out consecutive personal best laps as he battled with much more experienced drivers. Unfortunately the front running pack’s lead was nullified when a late race safety car condensed the field. When racing resumed, Reece found himself in a battle royal and by the chequered flag had slipped to sixth position. Behind him Ryan had used the safety car to his advantage clawing his way back to 11th position. Reece’s sixth place finish put him on the third row of the grid for race two and he was confident the legs of the V8 Holden could carry him closer to the front on his first run up mountain straight. Mechanical problems saw Reece knocked out of race two while Ryan clawed his way through the ranks to finish in ninth spot. An ecstatic team owner/manager Terry Marchello said the team had proven they are well on their way to reaching a winning formula. “The boys drove with maturity, and showed everyone that they have what it takes to succeed” Terry said. To find out more about MRTeam, visit www.mrteam.com.au or follow them on Facebook. 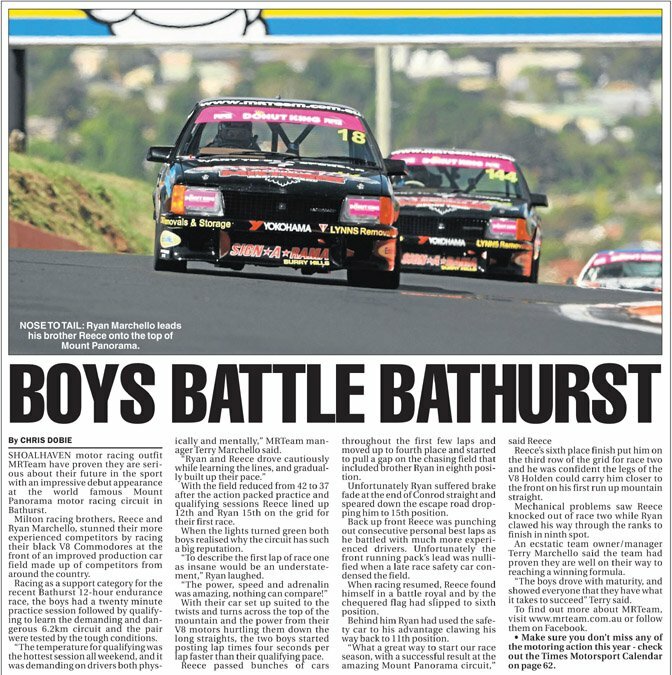 South Coast Register SHOALHAVEN based V8 racing crew MRTeam is gearing up for their final state championship race of the season... Read more.